It doesn’t matter if you’re talking to the dentist or the hygienist, both are experts when it comes to managing your oral health and helping you improve whenever possible. Of course, it’s understandable if you feel shy initially. The fact of the matter is the team members at the practice can’t read your mind, but it also makes sense if you aren’t even sure where to start. By going over this brief list, striking up a conversation about dental health should be much easier. 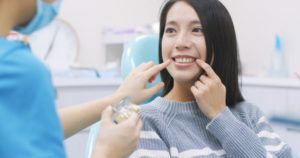 Even if you have a perfect bill of health when it comes to your teeth and gums, it doesn’t mean there aren’t ways to improve your oral care even more. Hygienists are more than happy to provide their preferred products that they believe are the most effective for complete oral health. Hygienists can also recommend services in the practice that work to strengthen your teeth and protect yourself from future disease. Fluoride treatments are a great example, even if you aren’t a particularly young patient. Are There Bumps or Sores In or Around My Mouth? In most cases, bumps and sores are likely just canker sores, which are harmless ulcers that typically heal on their own. If any sores or bumps do not heal after a two-week-long period, then you’ll want to get to the dentist as soon as possible. While it could be nothing, you’ll want to make sure you have the suspected area checked out in order to confirm that no problems are present. Dentists and hygienists are trained to recognize serious dental disease, including oral cancer. Is Sensitivity, Dry Mouth or Strange Mouth Odors Bad? If you’re experiencing dry mouth on a daily basis, it could be a sign that something is wrong with your salivary glands. It could also be a sign of an infection or early signs of unmanaged diabetes. Tooth sensitivity could be an early sign of a teeth grinding habit, which can result in permanent damage to enamel if left untreated. Regardless of the cause, you should not feel embarrassed or afraid to mention these symptoms. Your dental team is always prepared to solve your issues at their source, not ignore your concerns. Should I Inform My Family Doctor of My Oral Health Status? Oral health affects overall health in a wide variety of ways. For example, pregnant women are more prone to gingivitis due to fluctuating hormones. If you have a medical condition that affects your immune system, it means you’re more vulnerable to dental infections as well. Either way, keeping all your doctors on the same page in terms of your oral and overall health is better than leaving them in the dark. Got a question for your hygienist or dentist? Schedule an appointment today to stay informed! Dr. Chris Long earned his DDS degree from the University of Texas Health Science Center at San Antonio. Thanks to his extensive education, training and experience working in dentistry, he’s more than qualified to answer any questions you may have about your health and oral hygiene. To learn more about his practice or ask a question yourself, you can contact him through his website.